Engage3 is a sponsor at the CGA Strategic Conference this week, where hundreds of professionals from the California grocery industry convene to collaborate, network, and learn about the latest trends. Engage3 is showcasing its Competitive Intelligence Platform and Competitive Price Response products at the event. To attend, you can register here. One of the largest opportunities for retailers today is to improve their visibility and figure out how their competitors are pricing within a given market. The challenge is how they can do that using their existing budget. Some large U. S. retailers are making their price adjustments based on a single competitor location in a region. Take a market like Atlanta, for example, which is an area of 8,300 square miles with more than 6.8 million people. Many retailers will take that market and price check one competitor location there, and then base their pricing for the whole Atlanta market, using this very limited information. “This is not a very good way to get your pricing right for your customers,” Lyle Walker, VP of Strategic Enablement at Engage3, says. The real opportunity is for retailers to improve their visibility and really understand how their competitors are pricing their products across the market. Engage3 solves this problem by utilizing online data, in-store data collection, and machine learning to QA collection processes. This leads to data that is accurate. We then deliver this back within hours so a retailer can really understand what their competitors are doing across their markets and locations, and even understand what their competitors’ KVIs are, etc. “Without adding to existing competitive shop budgets, we can give you a window into your competitors’ reaction to new prices. We can track this over time and measure it, and then report against it,” Walker said. “You can make refined decisions that are localized to your markets and to your customers who shop at those sites,” he added. Watch Lyle talk about what it takes to have comprehensive competitive pricing in your market. 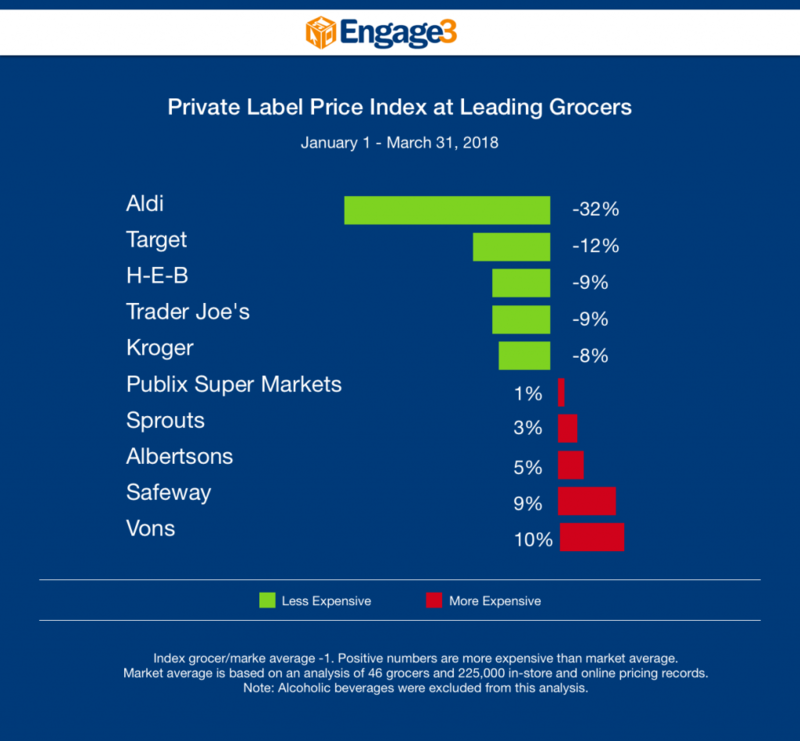 In a study of prices across more than 2,000 items and more than 225,000 pricing records collected during the first three months of 2018, Engage3 reports on who led in the private label, national brands, and fresh areas across 46 different banners. 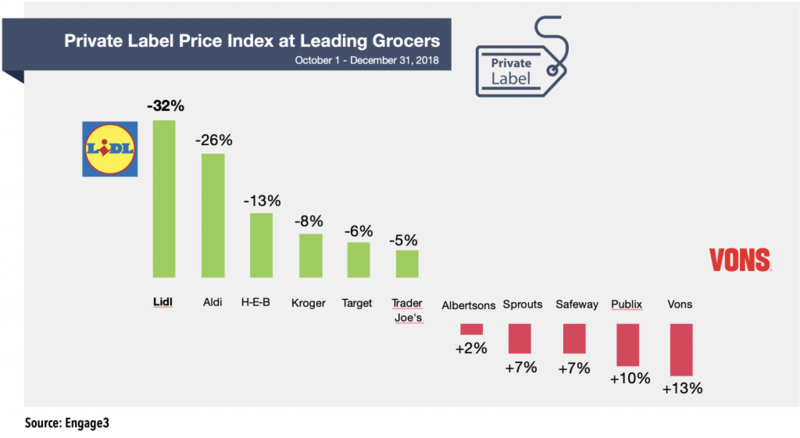 Aldi led in lower prices on average at -32% less for its private label, beating Target, H-E-B and Trader Joe’s, who came in at -12%, -9% and -9% lower prices respectively, in this study. At the other end of the spectrum, Vons trailed everyone else with the highest pricing for private label at a price index of +10%, followed closely by Safeway at +9%. 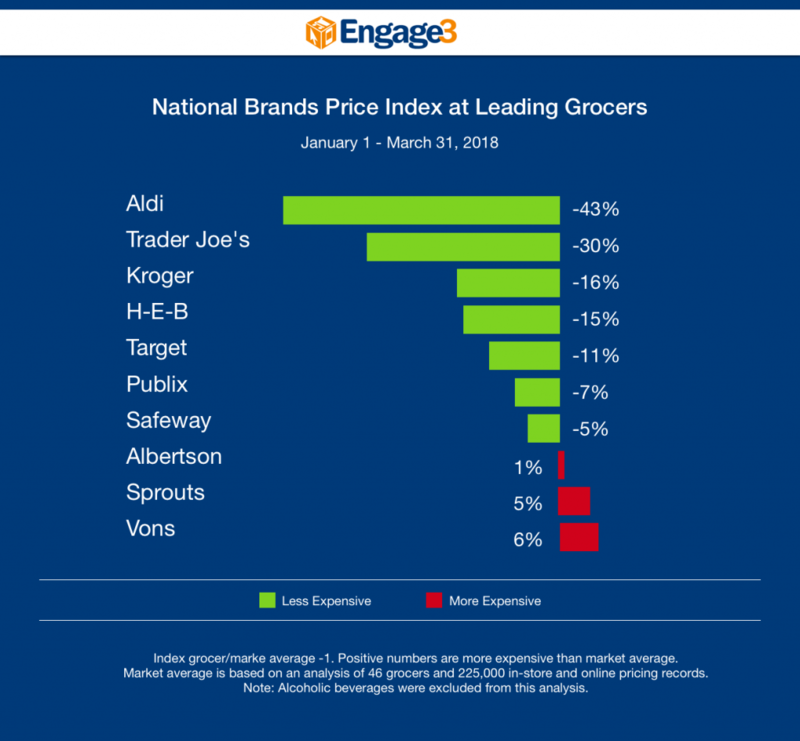 Aldi and Trader Joe’s, who carry a very small number of national brands in their stores, still managed to lead at -43% and -30% lower, respectively, in average pricing for the items in this study. 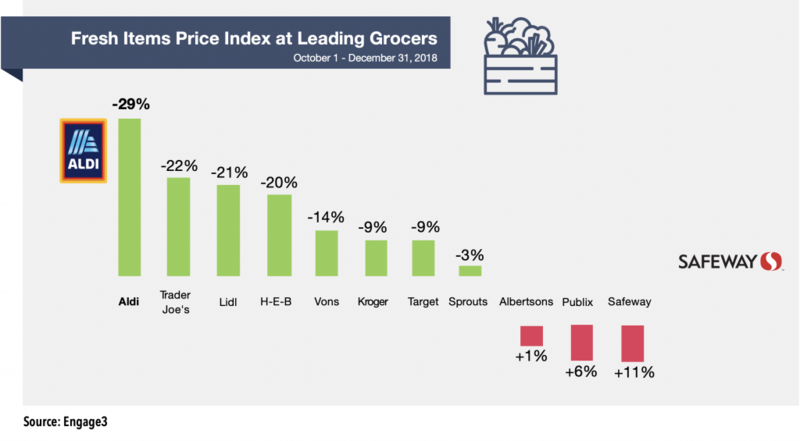 Kroger and H-E-B followed with national brand pricing of -16% and -15%, respectively, while Sprouts surprisingly lagged at +5% for national brands. 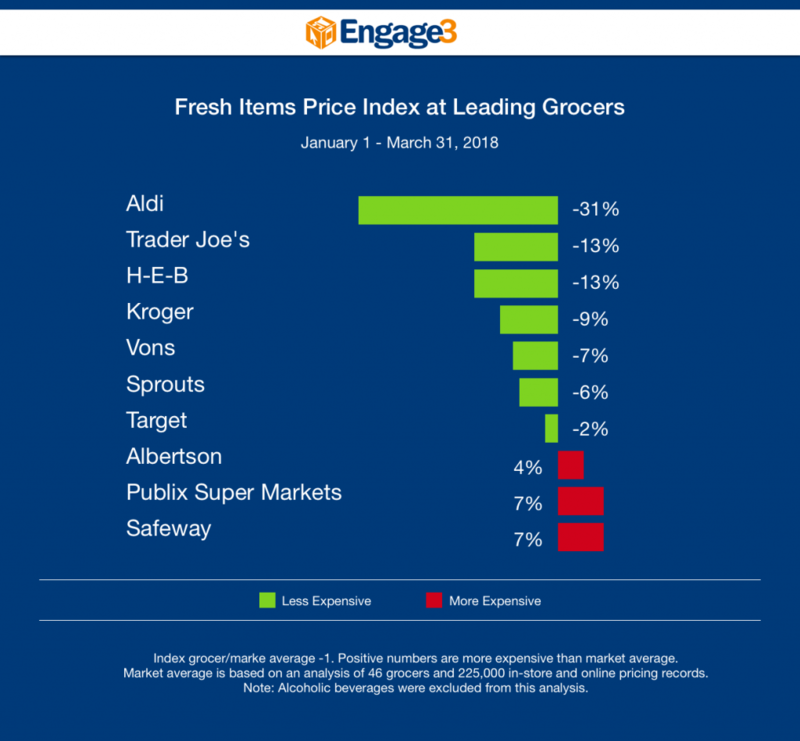 Aldi took home the top spot in lower pricing for Fresh items at -31% for Q1 2018, followed by Trader Joe’s and H-E-B on par at -13%. 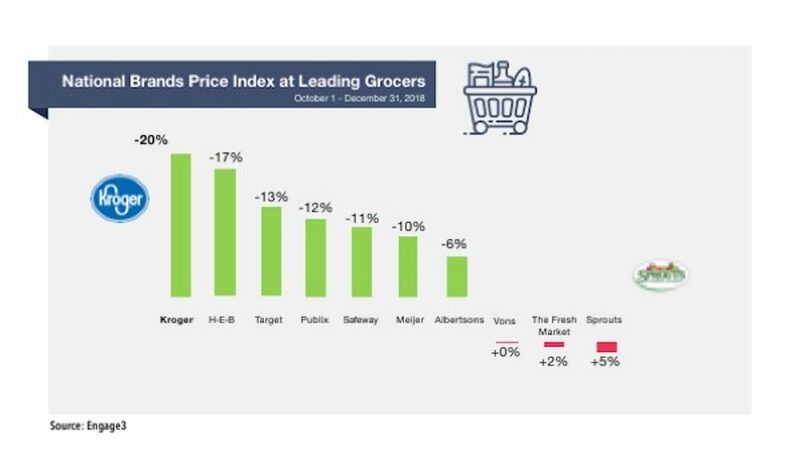 Publix Super Markets and Safeway charged the most in the first quarter of 2018, on average for the items in this study, with a +7% index. Albertsons followed those two at +4% higher average pricing for Fresh items. To receive a full detailed report or get more information about the full data, REGISTER HERE. On April 18 to 19, retailer C&S Wholesale Grocers held their 10thannual Tech West Expo at Thunder Valley Resort Casino in Lincoln, CA. Over 100 independent grocery retailers from the West Coast, including Hawaii and Texas, converged at the town Northeast of Sacramento. Listed by Forbes as the tenth-largest privately held company in the United States, C&S Wholesale Grocers is a wholesale distributor of food and grocery store items with headquarters in Keene, NH. C&S recently released their strategic retail pricing system and has chosen Engage3 as their partner for competitive retail pricing. “Engage3 IS the premiere partner in retail price information,” said Frank Puleo, VP of Retail Services at C&S. Engage3 is a leading provider of solutions that help retailers and brands improve their pricing performance and compete more profitably through data science & analytics. “We have worked with Engage3 for seven to eight years to deliver the best competitive pricing platform in one of our regions. Over the years, we’ve extended that partnership and now we have it on a national level,” noted Corey Quiring, Sr. Director of Corporate Retail Services at C&S. Edris Bemanian, COO of Engage3, will be a featured speaker on Wednesday, April 18 from 12:00-12:30 pm. He will be sharing his expertise on how retailers can enhance their pricing performance through machine learning and AI.